Monday means Adventure Notebook ... unless it's been a really busy weekend, in which case everything gets delayed until Tuesday. This week's delve is Hallways to Hell, where heat rules the lava pools. In Tuesday's post about lessons learned from Conan, I mentioned the idea that magic should be feared. That's a bit of a misstatement; what I really mean is that magic-users should be feared. Magic is power. Those who study it seek power. 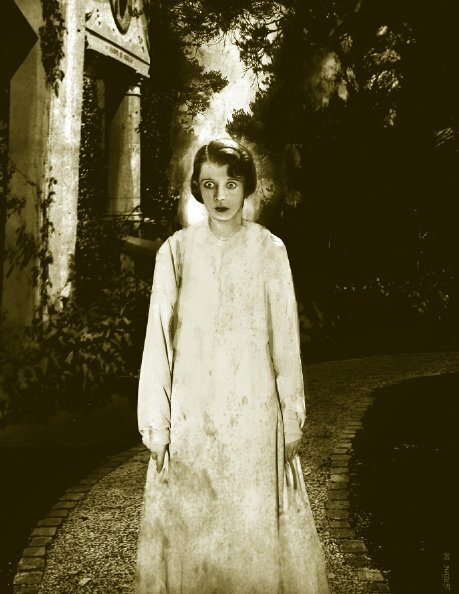 Even those who stepped onto the magic path interested only in knowledge wind up gaining power whether or not they want it, and as Lord Acton proclaimed, the simple possession of power threatens to corrupt even the stoutest soul. In this regard, magic is an almost perfect metaphor. It can corrupt its users not only psychologically but spiritually and physically, too. We have a long tradition of sorcerers who can be identified by their scarred flesh, inhuman gaze, and bizarrely misshapen appendages. 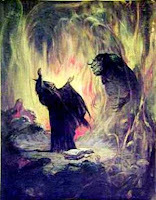 Wizards immerse themselves in taboos: they associate with dark forces, study death, and (most likely) challenge or at least question the authority of the gods. It's the wizard, then, that's feared. Magic use is a symptom of darker purposes and intents, and those are what inspire fear. The first half of the Chill adventure came off last Saturday, despite some confusion about the day of the game. Events unfolded almost perfectly from my point of view, and the Chill rules worked fine--though true to form in our horror sessions, we barely called on the rules. That should change soon. The adventure being played is "The Night I Died" from the Trail of Cthulhu collection Shadows Over Filmland. I chose this adventure because of its creepy Val Lewton-esque atmosphere. Lewton produced mood-heavy horror films such as Cat People and The Body Snatcher in the 1940s. I wanted that type of psychic unease to be central to the story. The risk with this type of scenario is that what I perceive as players unsettled by the unknown and the supernatural might really be players just frustrated by the unknown. There's no clear, straight path through the mystery. 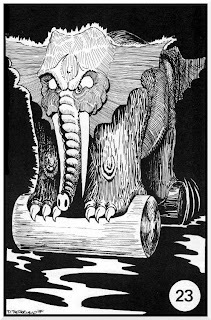 Most Trail of Cthulhu scenarios involve more than the usual amount of sifting clues for meaning and running down leads. I love that sort of thing, but not everyone does. I'm looking forward to collecting everyone's reactions to the scenario and to Chill after we wrap up the episode. It should reach a conclusion this coming Saturday. I'll post the synopsis and debrief next week. I’m no scholar of Robert E. Howard, just a fan of his storytelling and his best-known character, Conan the Barbarian. Conan first crossed my reading list when I discovered a shelf of dog-eared paperbacks at the local second-hand shop. I was still a relative newcomer to swords-&-sorcery fiction at the time, and Conan was unlike any hero I’d encountered in the welter of Tolkien clones at the library. Being young and impressionable, I read the stories nonjudgmentally. I didn’t know what portions came from Howard, from Carter, or from de Camp. The word “pastiche” wasn’t in my vocabulary. All three names got credit for everything, good and bad. No one should be surprised, then, that Conan looms so large in my imagination and in my preferences when it comes to FRPs. Conan and Howard taught me many valuable lessons for navigating the worlds of high adventure. 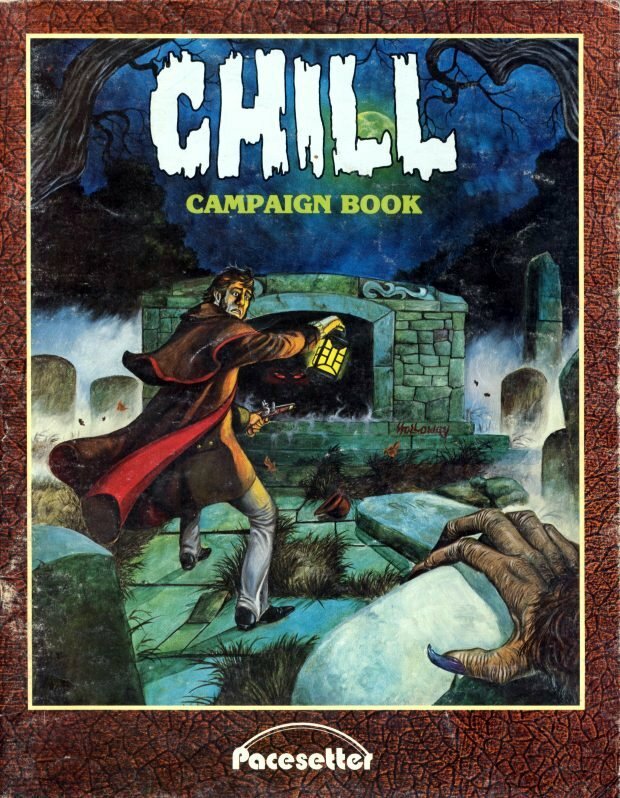 Saturday evening, I'll be running a session of Chill for the Call of Cthulhu group. We like to mix things up now and then, so we've experimented with other rules and other eras. This will be our first foray into Chill. The last few days have been spent getting reacquainted with the rules. Chill is a solid 1980s game with few pretensions. The designers knew what they wanted, and they cut straight to the heart of the matter. Some people have criticized Chill's use of a universal table for action resolution, but I like it. Chill's is done well and is fairly easy to use (with one small change). Whatever confusion might exist at the start of play disappears after a few uses. 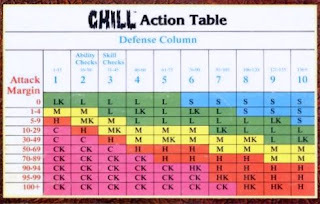 It's not flawless by any stretch, but I've played many games with more "elegant" systems that ran less smoothly, so I don't take criticisms of Chill's action table too seriously. My only disappointment with Chill was over the published adventures. Too many of them were roller coaster rides; plenty of ups and downs but no opportunities to veer off the track. That wasn't true of every Chill adventure, but it afflicted enough of them to leave a general distaste. For this outing, I'm adapting a scenario from Shadows Over Filmland to the Pacesetter rules. Filmland is just about note-perfect for Chill's Gothic atmosphere and emphasis on classic monsters. I expect to have a great time revisiting this game with a group of players who've never experienced it. It's given me a chance to re-watch some favorite horror classics from Hammer Films and American International Pictures, as well as to reread old ghost stories for inspiration. I've been steeped in Lovecraft for so long that I'd forgotten how much I enjoy Edgar Poe, Ambrose Bierce, M. R. James, and Reynolds's Mysteries of London. The crew that formed Pacesetter were all friends of mine: TSR expats looking for greater creative freedom away from the mercurial management and financial follies of TSR. They invited me to come along, and turning them down was one of the hardest decisions I've ever made. It ranks as one of the three major crisis points of my career, and I still wonder from time to time where I'd be now if I'd chosen differently. To go along with Wednesday's 36 trap triggers--36 trap effects. As a followup to Tuesday's brief primer on traps, here are 36 trap triggers for your dungeons. Tomorrow I'll offer up 36 trap effects. Combine the two and get 1 x 10^56 possible traps! Let me know when you run out, and I'll make more. The trap is a D&D icon. 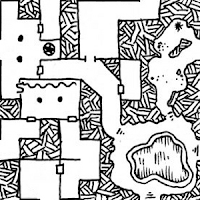 Classic dungeons such as Tomb of Horrors and The Hidden Shrine of Tamoachan are famous for their mechanical ambushes. Traps are so central to the concept of dungeons that an entire class—the thief—was developed to deal with them (along with locked doors). In real life, of course, archaeologists have never had to deal with this abundance of traps in ancient tombs and ruins. 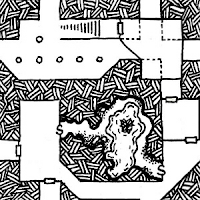 No trap of any kind has been found in an excavation: no scything blades, no darts with pressure-plate triggers, not even poisoned needles in treasure chests. Sliding blocks have been used to seal passages but never to squash intruders. Deep pits were dug in the entrance corridors of some tombs, but they were meant only as obstacles. 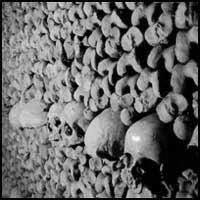 The pits weren’t covered, so only the most irresponsible of thieves risked falling in, and none of them left behind skeletons with broken legs. Tomb architects went to great lengths to keep people out, but no thought was given to killing them once they got in. GMs need to put some thought into it. Before putting a death trap in that hallway, you need to ask exactly what it’s for. Designing a clever, challenging, logical, dangerous, and yet enjoyable trap is one of the toughest tests facing a GM. One of the items on my list of topics for this blog is medieval demographics and the feudal system. 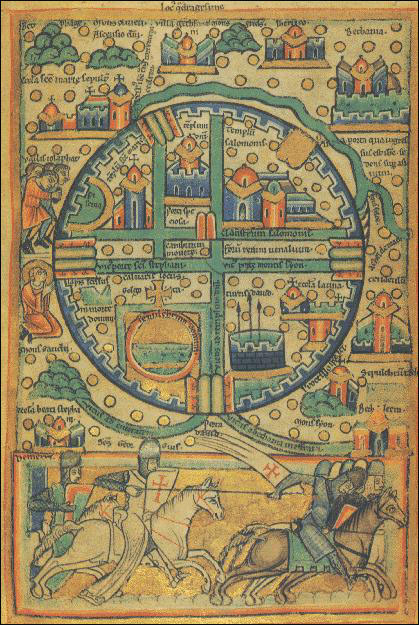 Today I ran across "The Medieval Kingdom" over at The Fascinating World of Charles Ryan. Charles hasn't been posting much lately, which I guess is how I missed it before now. I might get around to delving more deeply into demographics at some point (I find the subject fascinating, but most people appear bored to tears by it; can't for the life of me see why). In the meantime, you should read Charles's essay. He knows more about the subject than I ever will. 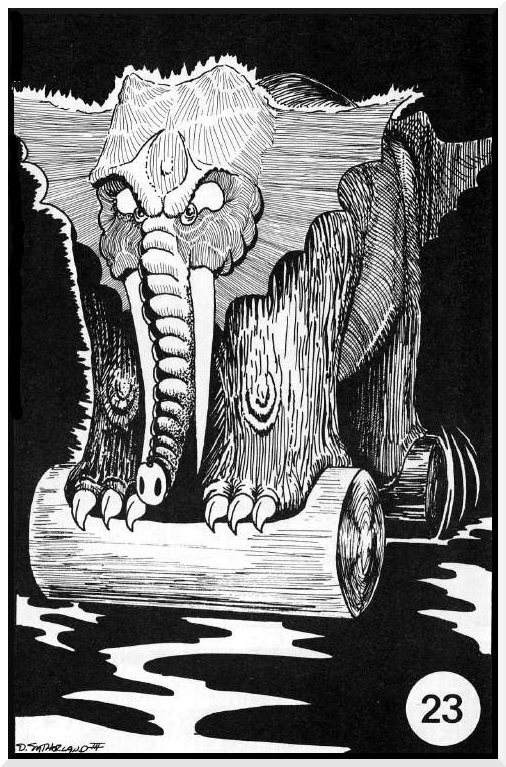 Demons and devils occupy an odd position in the pantheons of most fantasy RPGs. For the most part, those terms are just two more names in a long list of monster classifications, not much different from fairies or talking animals. They’ve been stripped of their terrifying spiritual implications. That’s a shame, because their unholy aspects are what make demons and devils so fascinating in our collective, churning imagination. Reducing them to scaly super villains deprives our fantasy campaigns of some fascinating potential. Sadly, the same affliction cripples most RPG “gods,” who are diminished to the status of remote, somewhat apathetic super heroes. D&D’s cosmology throws more oil on the hellfire by pitting devils and demons against each other instead of uniting them in a mutual war against Heaven. A movement is happening in the shadows of the big fantasy RPGs. It calls itself the old-school renaissance, or OSR for short. You might have seen its logo popping up around the web. Like most grassroots movements, there’s no specific date when this got started. It’s tough even to say whether what we’re seeing is a true renaissance or just greater visibility thanks to the web. Old-school blogs are easy to find. I run across a “new” one every couple of days. The best of them are outstanding. They offer some of the best RPG blogging out there. Every edition has its adherents who never jumped to a newer version; they get everything they want from whichever generation of D&D they’re playing. What distinguishes the OSR from people who never stepped away from AD&D or OD&D is the appearance of retroclone games. Retroclones are newly written games that emulate the rules and frequently the writing style of D&D rules from the 1970s and early ’80s. 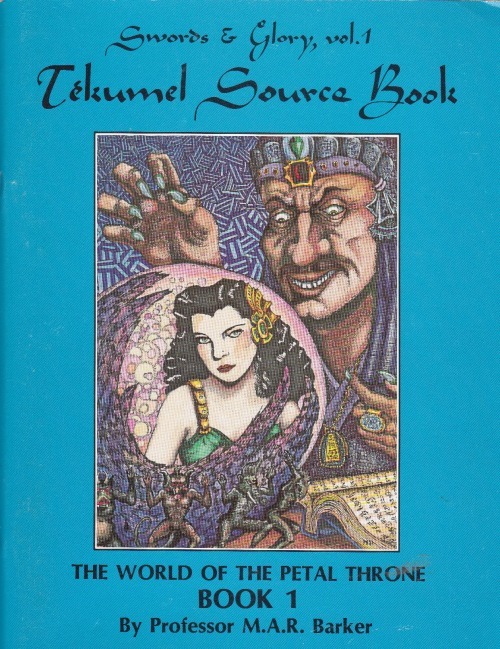 These publications are made possible by the OGL and the SRD (and possibly by a lack of interest or time in the Wizards of the Coast legal department).